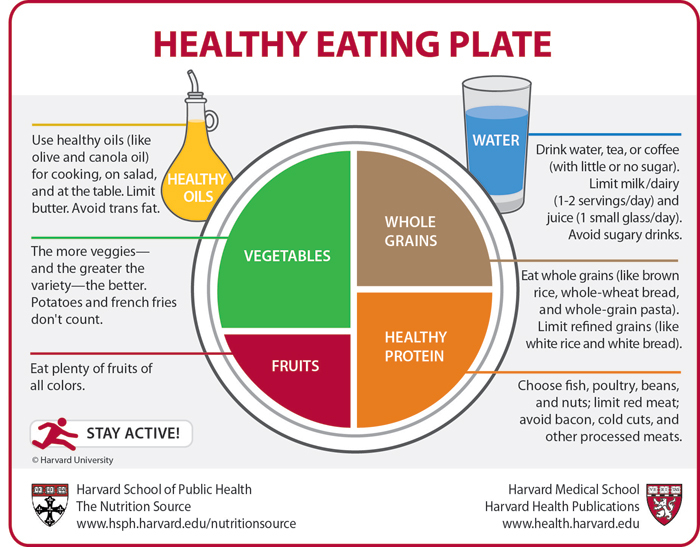 Harvard School of Public Health and Harvard Medical School released their version of the US department of Agriculture's (USDA's) MyPlate icon a few days ago. Given the current rising obesity trend, it’s obvious that we humans love to eat with the majority of us unable to balance intake with energy expended. The need for disease prevention and nutrition education with help on how we can slim down our curvaceous figures and control our portion sizes has never been greater. 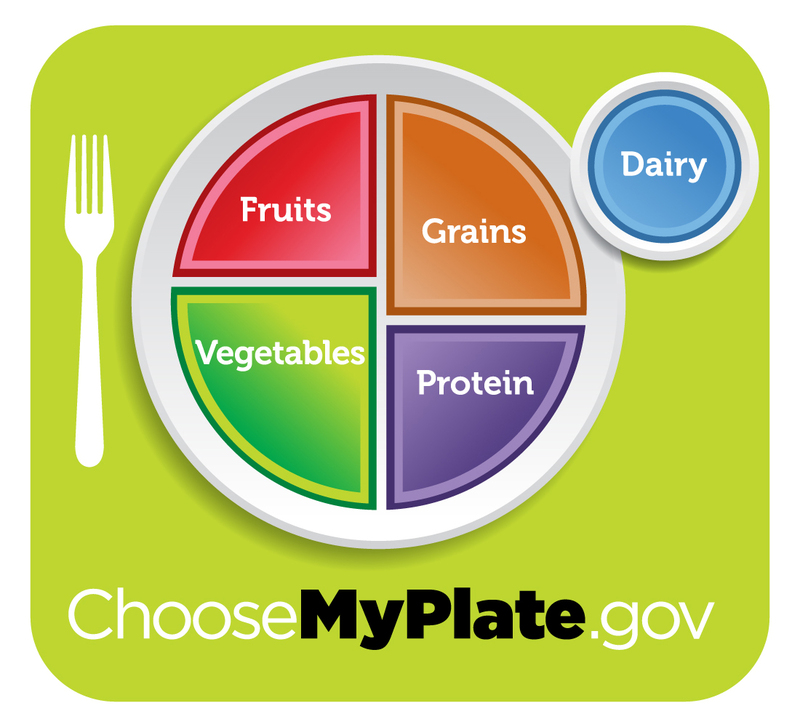 The governments MyPlate icon was designed to be simple and easy to understand. 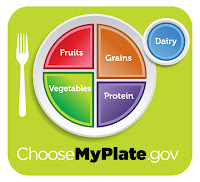 Critics, including nutrition experts at Harvard, felt the MyPlate icon needed to say more. 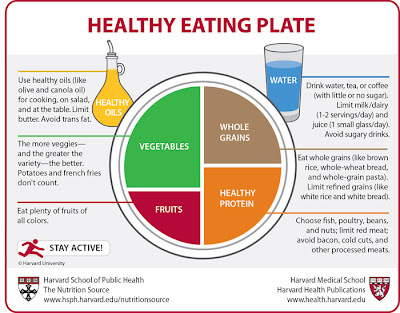 Harvard's Healthy Eating Plate was released September 14, 2011 and may be helpful to those with higher literacy levels eager for more specific information about what they should consume for good health. Marion Nestle, author of the book, Food Politics, was right on top of this story. She posted the Harvard vs USDA news on her blog and asked her readers to weigh in on the subject. Comments are still flowing in, ranging from those in favor of Harvard’s Healthy Eating Plate to those who dislike some or all parts of it. Several of Nestle's readers said that portion sizes were not mentioned. I think portion sizes are indirectly implied by the segmented plate graphics. If one assumes a plate size of approximately 8-10-inches, a quarter of the plate for protein for example, would be approximately 4-6 ounces of meat or fish as recommended by the USDA. It is the proportions of the food groups that are being emphasized with ratio of 3/4 plant foods to 1/4 lean protein. Harvard jumped right in and rather than saying, “Make half your daily grains whole grains,” they recommend whole grains... period. What better a time for that suggestion than during Whole Grains month in September! I like the 'Stay Active' fitness image Harvard shows too. We all need a constant reminder of the importance of daily physical activity, which was missing in the new MyPlate image. The garden gods got angry when they heard perhaps the most controversial of Harvard’s recommendations, which said, “… keep in mind that potatoes and french fries don’t count.” As a proud potato gardener, with all due respect to Harvard, I think they are wrong with that comment. Perhaps they meant that they don’t count because French fries are what most kids and non-veggie eating adults consider as their vegetable duJour. The trouble with potatoes is that they usually are prepared deep fried and can be high in fat and sodium. Potatoes vary in species with different nutrients found in each. Blue potatoes are high in antioxidants and other nutrients; one medium sweet potato is a good source of dietary fiber, B6 and potassium and an excellent source of Manganese and Vitamins A (21,907 IU, 438% DV!) and Vitamin C (22mg, 37%DV). In fact, just a plain medium baked potato is an excellent source of potassium, Vitamin C and B6, and a good source of dietary fiber, iron, magnesium and other nutrients. Harvard added Healthy Oils to their image, which was lacking in the USDA’s. Some are saying Harvards oil artwork is out of scale and too large. I'm glad they included it and think the size is okay, but the color inside should be much less (under the text, healthy oils) to better represent the need for only 3-6 teaspoons of oil per day, as recommended by the USDA. This would also be in keeping with the American Heart Associations (AHA) recommendations to limit total fat intake to less than 25–35 percent of total daily calories with saturated fat less than 7% of total calories and transfat less than 1% of total calories - leaving most fats to come from mono and polyunsaturated oils. The AHA notes healthy fats are also found in nuts, seeds and fish. Should Dairy be a food group? Many people get frustrated over the obvious influence of food advocacy groups like the dairy and meat lobby's who exert their powerful influence during the creation of public nutrition education tools. Dairy products, especially low-fat and non-fat milk and yogurt products provide good sources of calcium and protein to people who can consume them. Interestingly, the majority of adults worldwide are lactose intolerant and are unable to digest the milk sugar lactose. Calcium is also found in tofu, almonds and many veggies, including bok choy, collards and kale, which is why people who avoid dairy products due to lactose intolerance or for vegan, ethnic or other reasons, can still be healthy. Harvard nutrition experts lessened dairy recommendations to 1-2 daily servings, rather than the USDA’s suggested 2-3 servings. They also suggest consuming beverages with limited sugar content such as water, coffee or tea and recommend no more than one small glass a day of juice. One of Nestle’s commentators caught my attention saying, “It’s a typically all-or-nothing Americanism, this notion that every meal should be structured around maximizing nutritional content. Where’s the pleasure or the variety in such a scheme?” She has a point. Food is an enriching cultural part of our lives and of course should be enjoyed. It’s rare to see anyone eat a structured plate at every meal. Perhaps in the future we’ll see a different logo altogether with two or more individuals gathered around a table sharing a meal with graphics of food groups on the table presenting the same overall good nutrition message: be active and eat lean proteins with most of your foods (3/4 of a plate) from plant foods to lower the risks of weight gain and chronic diseases. Blog Article and potato photo Copyright © 2011 D.Wind. All rights reserved.